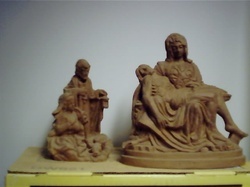 custom wood carving, engraving & turning Page 2 photos, Page 3 photos, balusters, multiple spindle carving, rosettes, CAD/CAM, antique & architectural; routed signs, engraved plaques; police, firefighter & armed forces retirement plaques; historic preservation replication, ultra high-speed & LASER engraving; wood signs, carved wooden angels, holy family, Ten Commandments & Lord's prayer plaque; future: the last supper, 1 hour west of Chicago, Elburn, Illinois 60119, please call first 630-365-9488. Custom mantel carving. Holy Family. Pieta. Both cherry wood, private collection. Cherry Last Supper. 1x4x8". laser engraved. Danish oil finish. buffed bees wax. 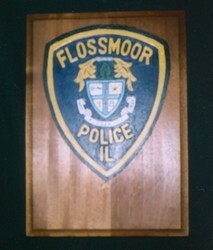 Cedar sign for lawyer in Aurora, Illinois. 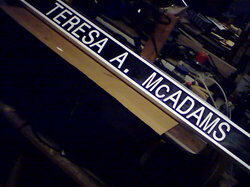 Raised text and border handpainted white, routed background with ebony stain. Matched existing signs at law office. 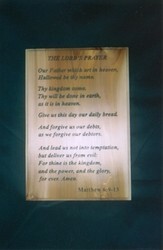 The Lord's Prayer. 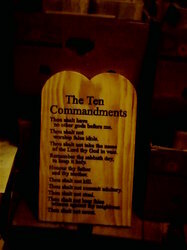 Cedar, V-carved text, lacquer finish with stain, 11"x16". Catholic version available approximately 7"x8". 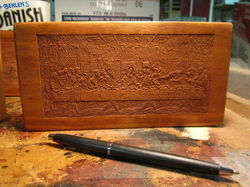 Mahogany, carved, hand painted retirement plaque. Can be made for Police, Firefighters, Military and other Agencies.